Merry Christmas eve, lovelies. I don't know about you, but I just love this time of year. Good food, good friends, family time, and lots of festive gatherings! What's not to love? And so that's why I'm just so excited to share with you this fabulous styled shoot that our friends over at Urban Style created with the holidays in mind. Some details to be on the look out for: Touches of chevron, sequined pillows, pretty packages, over sized pine cones, and the loveliest cranberry and gold color palette I ever did see. Talk about beautiful! Am I right? And this color? Wow! I can't say enough about these beautiful cranberry infused colors and the way it pairs so effortlessly with this glittery gold. I swear, I wish I could just jump into this scene and stay a while. I'd be sure to make myself a festive drink, play a little urban bingo and maybe even wrap a gift or two. Hey, what can I say? I'm always looking for an opportunity to multi-task. And well, I'm not done wrapping! I know, I know... will I ever learn? Happy Holidays, friends. I hope you all have a beautiful Christmas filled with all the stuff that matters most! 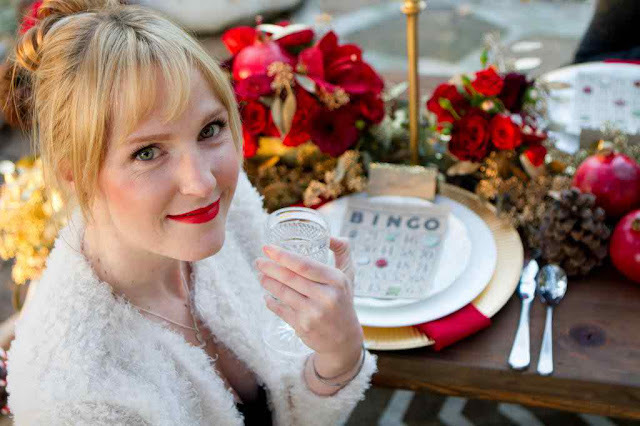 5 Comments " Cranberry + Gold Holiday Shoot "
Love this inspiration. The bingo cards are such a cute touch. So pretty! I'm surprised to say I really like the combo of chevron and plaid in the textiles!